Irish soda bread is one of my favorite quick breads to make because it is so easy and so versatile. 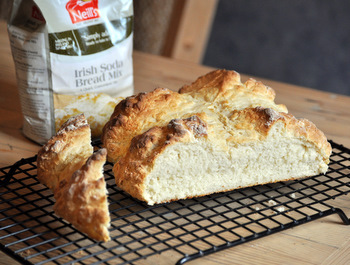 The history of the bread (not to mention the name) always emphasize how popular the bread is in Ireland, so while it is easy to make from scratch, I couldn’t resist giving Neillâ€™s Irish Soda Bread Mix a try because it actually comes from Ireland. The mix contains just flour, baking soda, buttermilk and salt, which are the same ingredients you’d find in a scratch recipe for soda bread. To make it, you simply add milk or buttermilk to the mix, shape it in to a loaf and bake it. The bread turned into one of the most beautiful loaves of soda bread I’ve seen, and was perfectly browned on the outside while remaining moist and tender inside. It was much lighter than some soda breads that I’ve had, which tend towards being rather dense and heavy. It stored well and still made great toast the next day. The bread had a subtle buttermilk flavor, which you can enhance by using more buttermilk as your liquid (as opposed to plain milk). I should also note that this mix makes a great base for mix-ins, if you want to add raisins or other dried fruits for a sweet soda bread or feel like stirring in some herbs or sun dried tomatoes for a savory version. There are a few suggestions right on the packaging. The mix has just recently become available in the the US, so keep an eye out for it if you want to give it a try. Sounds good–I’ll look for it. I’m not usually a big fan of mixes but companies have gotten better with them. 🙂 I hope you don’t mind a link to another website but I just made this Cabot Cheddar Soda Bread that is amazing. You might want to give this recipe a try. I’d love to have a link or know where you were able to purchase this? Beth – I’m not sure if it’s available at any regular markets, but a store that specializes in imports (if you have a Cost Plus or similar store) in your area probably stocks it. I found this flour at big lots for $3.00 a bag. I wasn’t sure how good it would be but it turned out to be really easy to make and tasted just like the soda bread I remember from home. I went back and bought 6 more bags….I used buttermilk rather than regular milk.